Throughout the month of June, 30 new trees will arrive in Stuyvesant Town and Peter Cooper Village. The “30 Trees in 30 Days” program began on the first of the month, with a new tree being planted each day. In an official statement, StuyTown Property Services, Blackstone’s management company, said the new arrivals are replacing a significant number of trees on the property that have been lost due to old age, attrition and extreme weather conditions. Chuck Hartsell, director of landscape and horticulture, mentioned that a major factor was the difficulties of being in an urban environment, as he passed some trees in the complex that he noted were on the decline. On Friday morning, the 11th of September, my wife and I exited our building on the M level to find an utterly awful sight: a gutted oak tree. It was one of the two live remaining oaks adjoining the area previously set aside for plant deliveries and the storage of granite blocks — and now, unintended, for a doggie-walk area. One oak now remains. Given its natural and its over-pruned condition, it is a prime candidate for “scientific” removal. Most of the canopy trees in our area are either oaks or London Plains. The canopy trees are under attack. The attack has come in two distinct forms. The first is nature itself; the second is management and Bartlett Scientific. Each acts perfectly within its own right, and comes, as we should expect, with tons of assurances. Management, I was told by the driver of the Bartlett truck, points out the tree to be cut and Bartlett applies the coup de grace — done scientifically of course! 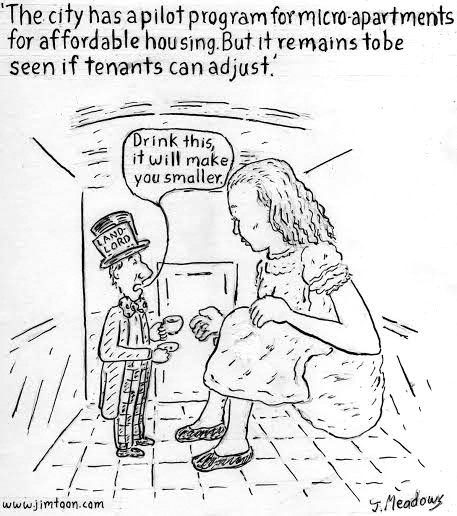 The danger for we who rent here is the gradual loss of the shade and cooling effect that these trees have provided. When left to nature’s own way, these trees grow up to 90 feet and have a spread of up to 70 feet (the spread is less for the oaks). The imported ornamental trees have neither the height nor the breadth and provide no such cooling effect. Unlike the permanent residence of the American plane and oak trees, these trees serve other interests (local and out-of-state). When I asked the driver of the Bartlett thingamajig about the tree, I was told that the tree was dead. Now you can bet, when management and the scientific folks tell the rest of us that trees (there have been many instances) with green leaves are dead, that explanation is most certainly not rooted in the interests of tree care. “Tree care” is merely the facade. We who rent here may not have the physical muster to prevent the wanton destruction by expert/scientific pruning of our canopy, but it is our responsibility to care for that which is life itself. 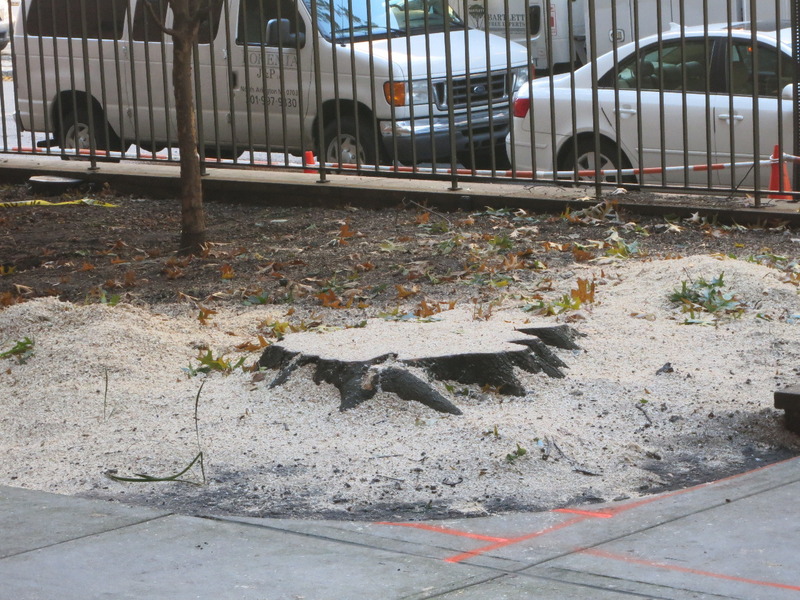 A tree near 440 East 20th Street was cut down. 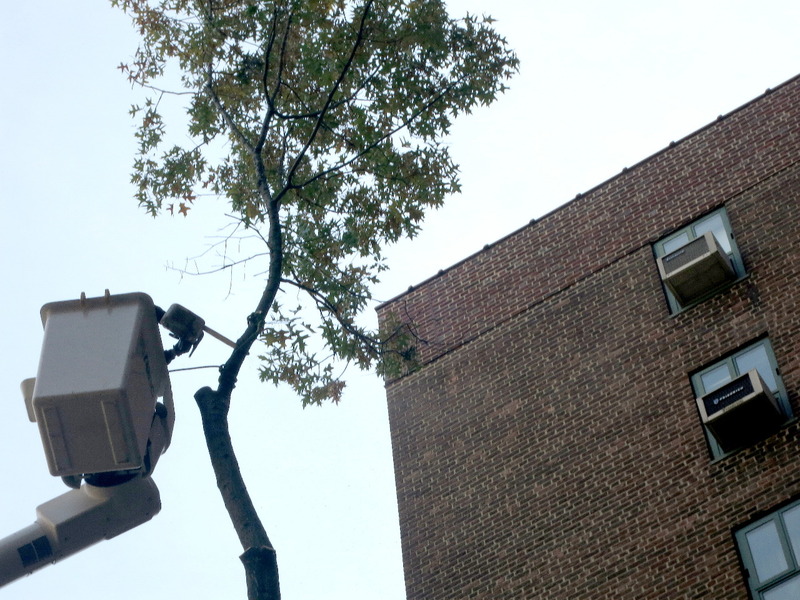 Last Tuesday afternoon, a Stuyvesant Town resident walking past 440 and 430 East 20th Street said she noticed that a very tall, mature tree was in the midst of being cut down. The resident, who asked that her name not be published, told Town & Village she’d asked a nearby Public Safety officer what was going on and was initially told that the tree was just being trimmed for safety reasons. be built alongside the building. The building already has a ramp but according to the officer, that one wasn’t up to code. The stump of the tree was later removed as well. The resident added that after she stuck around a while, it became clear that the tree was actually being cut down, so she headed over to the new management office to make a complaint about what seemed like unnecessary arborcide as well as the lack of notice that a tree would be coming down. That’s when she said she was told by a property manager that the tree was actually diseased. She didn’t get a response as to the lack of notice though other than management tends to get overwhelmed due to all the work going on at the property at any given time. After returning later in the day to the spot where the tree had been, the stump that had been there briefly after it was chopped was also gone. A spokesperson for CWCapital did not respond to a request for comment on the tree.